Inside the workshop M.M. 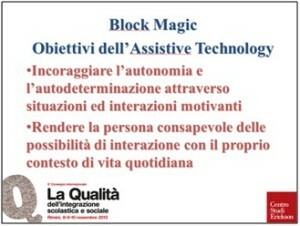 Coppa (LDFO) has presented the Block Magic Project and the results. In particular, he showed the studies of applications of Smart Objects Technology with one case of the Rehabilitation Centre of the Lega del Filo d’Oro involved in the program of activities of the project Block Magic. During the workshop, with the help of Walden Technology, it was possible to observe the technological equipment used in the studies. The workshop was attended by 100 people (psychologists, educators, specialized teachers of rehabilitation, teachers of public school, professionals from other public services). At the Conference there are more than 3.000 participants.